Preston Tucker launched his car company after World War II. One of the biggest events in his company’s story was the unveiling of his prototype Tucker ’48–sometimes called the “Tin Goose.” Tucker’s enterprise ended a few years later and for a decade or so, the 51 cars he completed were not considered all that valuable. Today, however, a nice Tucker ’48 might auction for more than $2 million. Still, there was a time when you might see a Tucker stuck in the mud out behind a barn. Occasionally, copies of these photographs show up on the internet with the suggestion that you might still be able to find yourself a Tucker stuck in the mud somewhere, but that is really not the case. First, these photos were taken in the early 1970s, and Tucker experts can now tell us where every Tucker automobile extant resides. Along with the Tin Goose, there were 50 production Tucker ’48s built. There is one “missing” Tucker ’48 but it was almost certainly destroyed as pieces of it have surfaced. The photos here are of the Tin Goose and show it behind a barn in Pennsylvania. 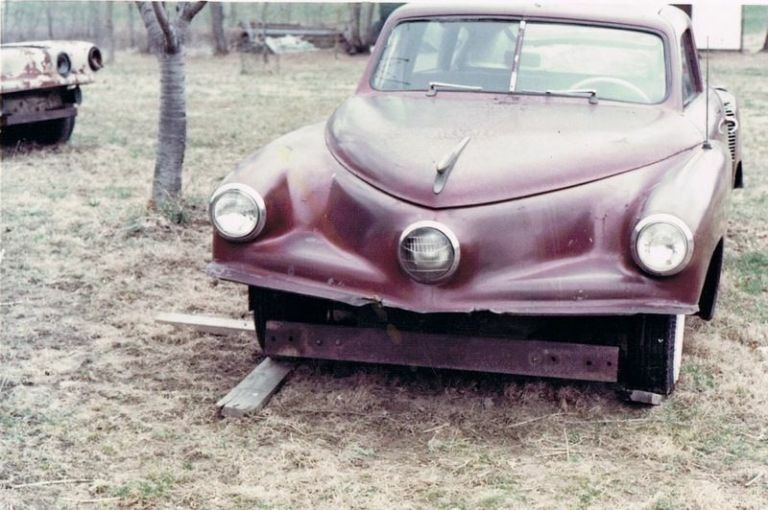 Notice that near it is the front half of another Tucker–#1018–one of the few Tucker ’48s which no longer exists intact. The Tin Goose was rescued from this field and restored shortly after these pictures were taken, although it was painted maroon instead of the red it wore at its world premiere. The bumpers which were missing as it sat in the field were also replaced and the rest of the car was restored. Although the Swigart Museum occasionally takes Tucker #1013 to car shows, it is almost always displayed at the museum next to the Tin Goose, which is always on display. The museum has an unwritten rule that while some cars rotate in and out of displays, the Tuckers are always on display. And considering the years the Tin Goose spent sitting in a farmer’s field, it certainly deserves to get the star treatment now.